Writer/director/producer James L. Brooks scores on all counts with this clear-eyed look at the television news business and the dysfunctional types who work in it. Brooks' intelligent script introduces us to Jane Craig (Holly Hunter), an ambitious producer at the network news division's Washington D.C. branch, who is calm under fire yet has a good cry at her desk every morning over her empty personal life. Jane works well with Aaron Altman (Albert Brooks), an excellent reporter who lacks the visual charisma to make him a star. 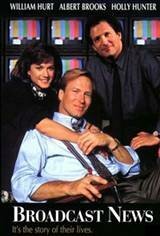 Into their lives comes Tom Grunick (William Hurt), a regional newscaster who admits he can't write news and doesn't understand many of the events he's covering, but has the presence and physical appeal that the increasingly entertainment-oriented network wants for its news programs. Jane is also physically attracted to him, which drives her crazy, because Grunick stands for everything she's fighting against in the news business, while Altman is devastated by her attraction because he secretly yearns for Jane. As Grunick becomes a rising star at the network, and layoffs of the old guard loom, the three leads deal with their feelings for each other, their careers, and their values. Hunter, Hurt, and Brooks are all superb, as is the excellent supporting cast (including an unbilled turn by Jack Nicholson as the network's smarmy national anchor). Brooks' script is funny, poignant, gritty, and brutally honest in its examinations of the television industry and the ways in which professionals interact on and off the job.